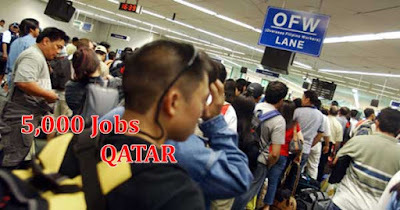 Another good news for our Filipino jobseekers is the opening of almost 5000 jobs in Qatar. AQs reported by the Philippine Overseas Employment Association (POEA), the economy of Qatar is strongly developing though the country is experiencing a diplomatic crisis between its adjacent countries in the Middle East. The said country needs skilled position including electrician/ship electricians (1389), mechanical engineers (497), carpenters (313), laborers (266), masons (220), welders (151), foreman (61), mechanics (61), plasterers (24) and nurses as the most in demand and with biggest number (1882). Besides on the positions mentioned above, there are other job opportunities in Qatar which are 4,875 in total based on POEA official website. Mr. Ronald Gabing who was a Filipino jobseeker and unfortunately was bankrupt on his business who worked in Saudi Arabia before and has a 4 years’ experience as welder has now his chance to apply in Qatar as a welder as it is one of the in-demand jobs there today. It is around 1,700 Qatari Rials or amounting to P23,000 and above the salary of a welder and other construction workers in Qatar. For a mechanical engineer or electrician, it is also almost P80,000 and above or 6,000 Qatari Rials is their salary monthly and for nurses which has the highest demand can receive 3,200 Qatari Rials or P40,000 and above. The country of Qatar will have a continuous job opening. According to POEA, there is numerous project to be established because of the preparation of Qatar for the upcoming Fifa World Cup on 2022 which will be held in the country. However, the diplomatic crisis between Qatar and other four Gulf countries which remains unresolved caused doubts to others that the planned projects will not push through but Qatar said that it wouldn’t affect the economy of their country since there have a lot of job employment. POEA advised all the job applicants that it’s no longer necessary for them to go directly to their office to check or inquire about Qatar jobs but they can access now the POEA official website in order to know the details about the hiring including the accredited recruitment agency who handles the job opening.